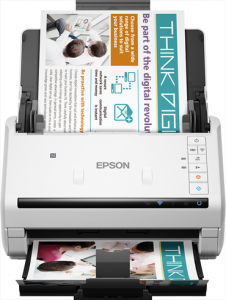 The Epson Workforce DS-520 and DS-520N document scanners are sheet-fed, duplex colour scanners with an optical resolution of up to 600dpi. The Automatic Document Feeder (ADF) will take up to 50 A4 sheets at a time (209 g/m) and with a recommended daily cycle of 3000 sheets per day, is more than capable for the needs of most small or departmental business scanning needs. 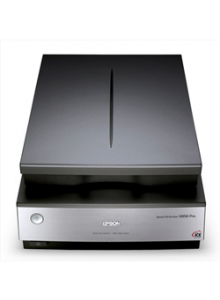 Ideal for professional photographers and serious amateurs alike, the Epson Perfection V850 scanner has a dual-lens, high-resolution intelligent system that converts a wide range of media and film into superb digital images. With enhanced optical system to help create superior-in-quality images at scanning speeds that are quick. 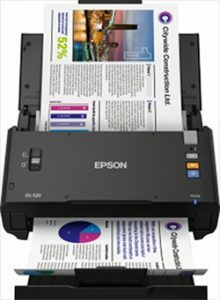 The Epson WorkForce DS-570W scanner is a sheetfed document scanner with Wireless connectivity built-in. There is also an optional Network unit available separately to give wired network connectivity, for added flexibility.